On a sunny day in June, the top floor at Oodi glows with light. Visitors feel almost like they have found heaven, because light floods in through the floor-to-ceiling windows as well as the round skylights in the ceiling. This heaven also has “angels”: people in bright yellow clothing are working on the suspended ceiling at a great height and preparing the book heaven for everyone to enter. 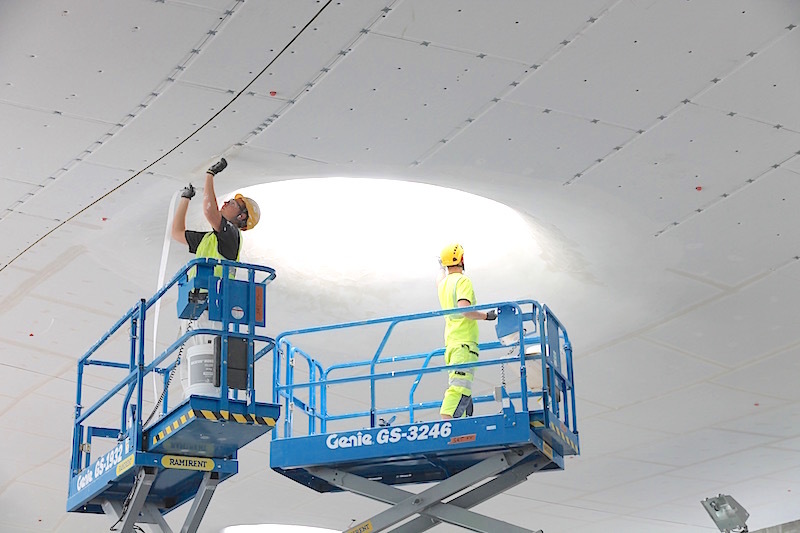 The “angels” have transformed the suspended ceiling into a smoothly undulating surface with the help of metal hangers and frames, attaching sheets of acoustic mineral wool into the frame. More than half of the ceiling is already complete, and the rest has been shaped into waves with the mineral wool attached. 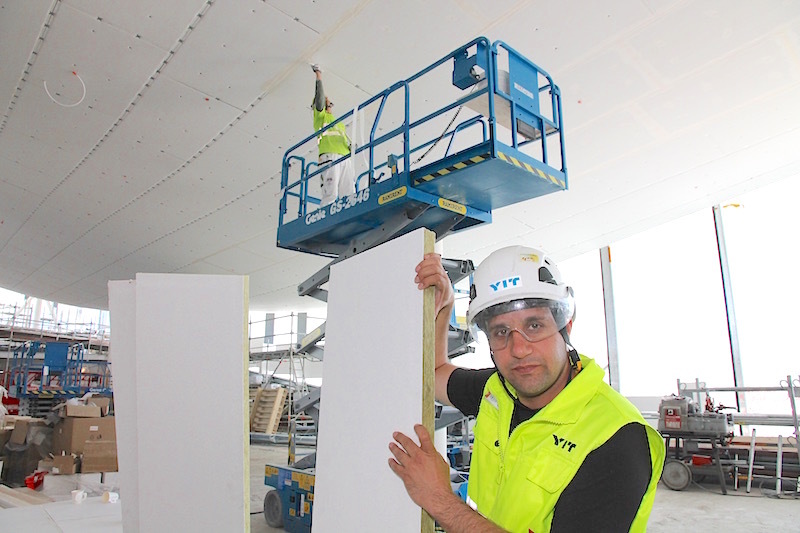 Site manager Mansoor Ardam presents the mineral wool sheets used in the suspended ceiling. The sheets will be sprayed with a porous coating that absorbs sound and creates a pleasant, muted soundscape in the space. In addition, the sprayed coating will make the surface look like a solid rock ceiling. The seams and mountings will be covered carefully with white tape that smooths out the surface before applying the putty. The ceiling will be prepared with putty and sanded three times before spraying, and the skylights will be sanded up to five times. 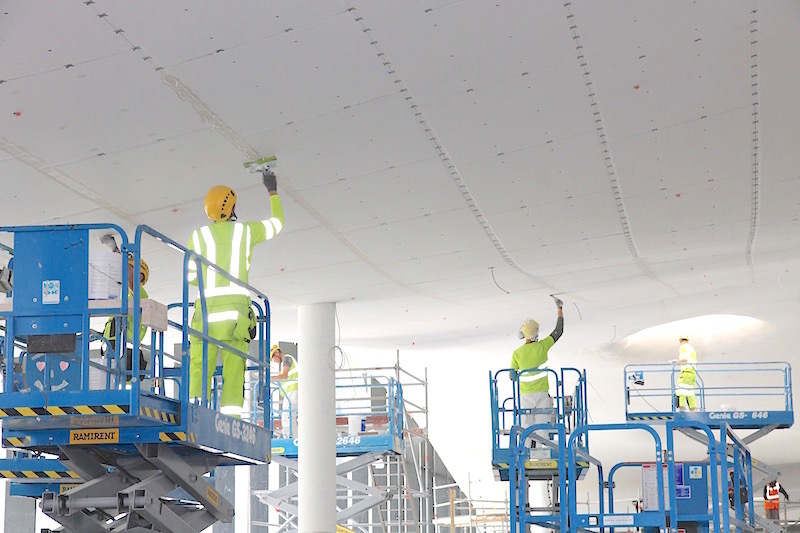 The finished surface will also be white, which means that the ceiling will reflect light into the whole floor. 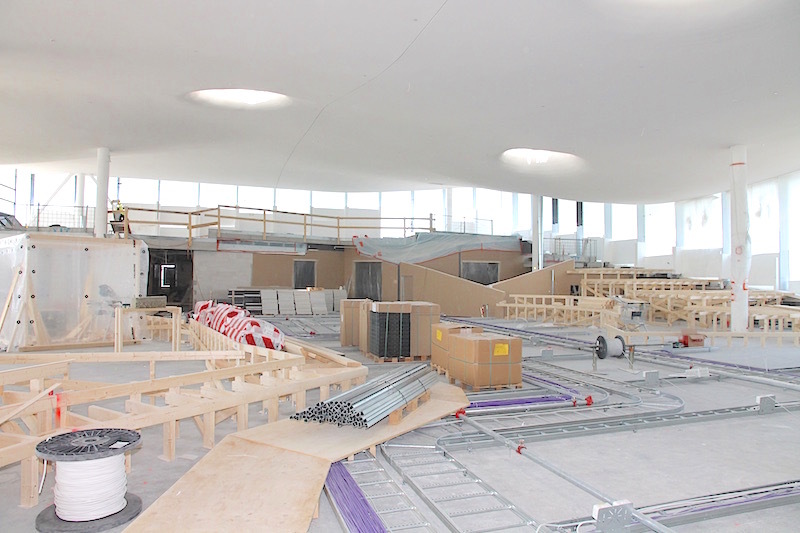 During the summer, the third floor will be bathed in sunlight, but during the other seasons, the floor will be lit with lighting fixtures mounted on the pillars. 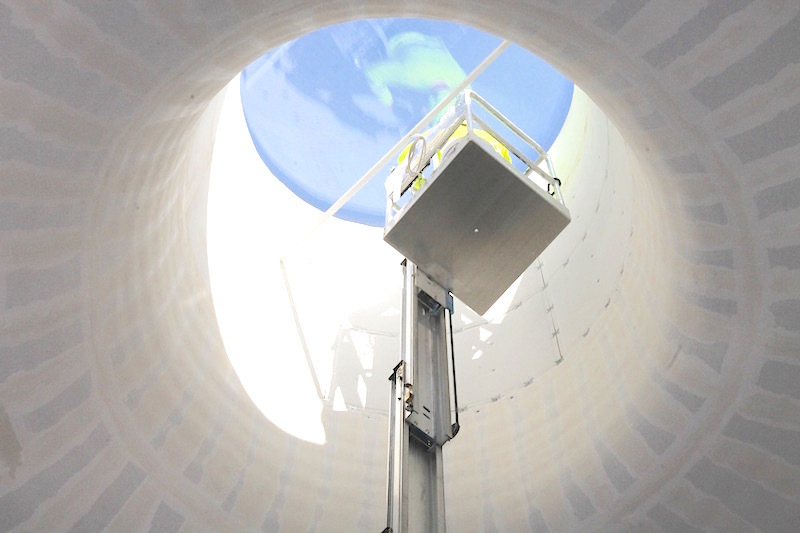 A separate lighting fixture will also be attached to each skylight. The book heaven will have a parquet floor. It will be installed after the electric cabling in the floor has been completed and covered by the raised floor. The work has progressed the furthest in the children’s world in the north end, where the construction of the raised floor started after mid-June. So far, Oodi has been wired with thousands of metres of electric cables, but only a little over half of the electrical installation has been completed. In contrast, the installation of plumbing and air conditioning is nearly 90% complete. The second floor in Oodi is dedicated to doing, working and interacting. Even though most of the work, meeting and group work rooms have been separated by glass walls, the floor will not be filled with chatter. The soundproofing values of the glass walls are high, up to 40 decibels on average. The number describes how much of the sound passing through the air remains. Breaks that prevent the sound from carrying have also been added to the framework, such as the floors. The gaps in the breaks in the floor have been filled with elastic putty that stops sound. 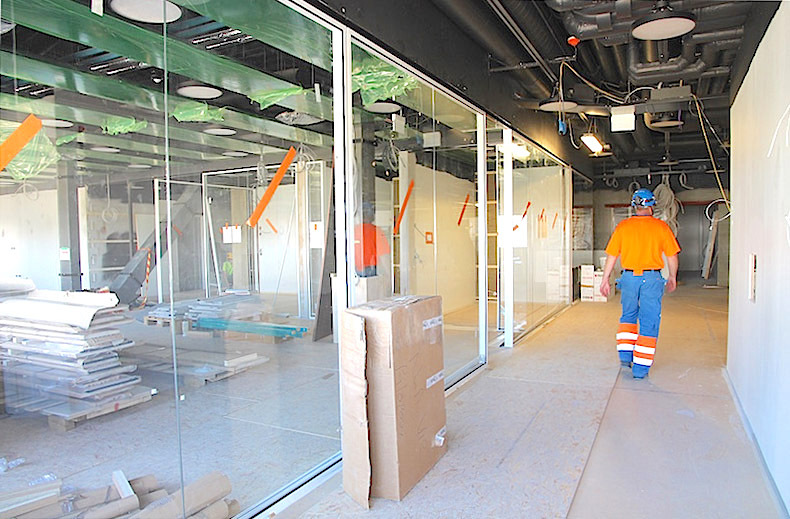 The glass partitions have been supplied by the Finnish company Inlook. The ruins of an old warehouse that have remained next to Oodi until now will be demolished after Midsummer. 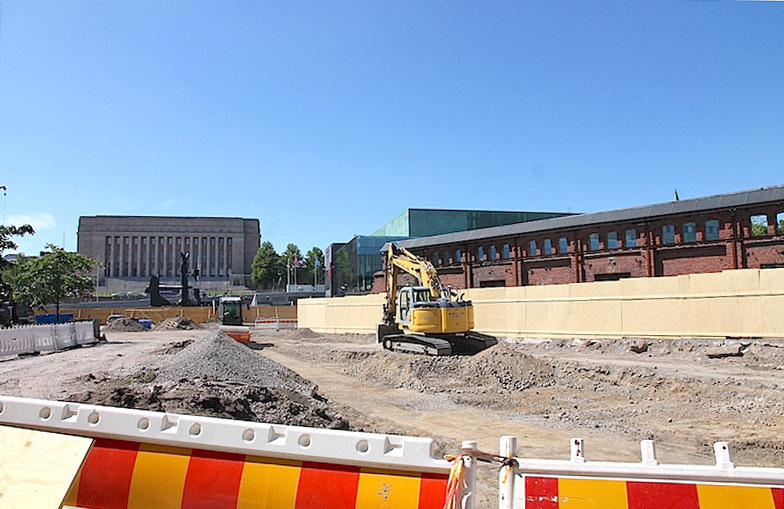 The work “Massa” (Mass) by the artist Akseli Leinonen will be added next year as a reminder of the old warehouses. The artwork in red brick that covers nearly 200 square metres will be located on ground level, at the same place where the southern end of the railway warehouses used to stand. The removal of polluted soil near the remaining ruins has already started. 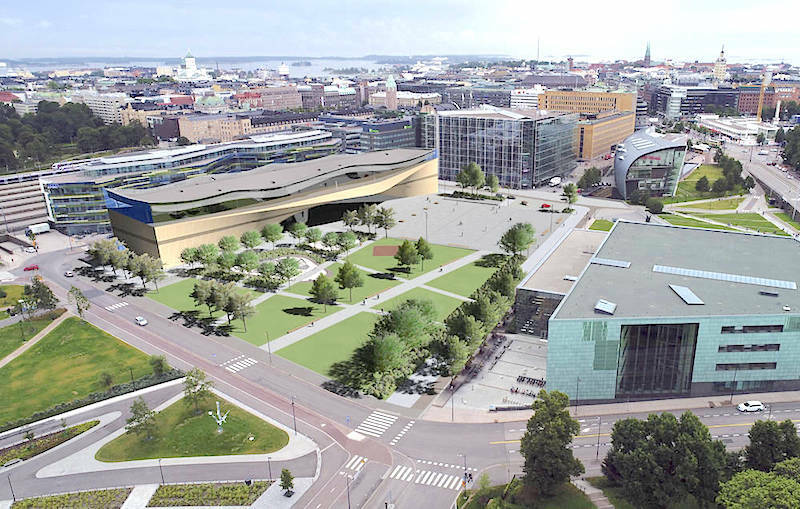 Let’s look ahead: The Kansalaistori square and the Makasiinipuisto park will be transformed into an inviting area with room for children playing, people spending time and public events. The children’s playground Loru will be built in connection with Oodi, and the garden-like eastern side of the Makasiinipuisto park will have a street basketball court. The lawn in the Makasiinipuisto park will have room for different kinds of events. The cultural buildings and parks will create a harmonious and inviting urban space.